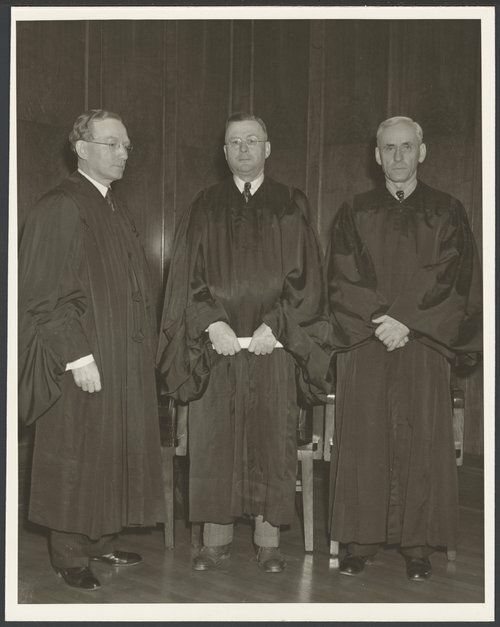 This photograph shows U. S. Circuit Judges: Orie L. Phillips is in the center with Walter A. Huxman at his right and Sam Bratton on his left. After holding governor's office from 1937 to 1939, Huxman was appointed to the U. S. Court of Appeals for the Tenth District in Topeka, Kansas by President Franklin Roosevelt in 1939. One of his notable rulings while serving on the bench was on June 25, 1951, during the Brown vs. Board case in Topeka, Kansas, where the court found "no willful intentional or substantial discrimination".